I know, you lucky ducks, you. If you read to the end of the last cup you’ll remember that ticket we got for my tabs being expired.You did read that one right? 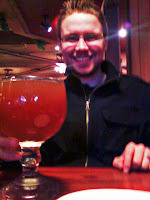 Oh, and I forgot to add the picture of Matt and the biggest goblet of beer ever. Well Monday Matt was off and the licensing place in Ballard was open till 6, so we had a small 30-minute window to get our new plates. Matt got there first and, since it was a bit hard to find and parking was a chore, he stood out on the sidewalk directing my place into the tiny lot and then stood in a spot that emptied and stared down other hopeful parkers until I got there. This place was definitely not the DMV, I’ll tell ya. We walked right in and were next in line—nice! The man who helped us was a middle aged black man who wore a newsboy hat, a gray button up fleece shirt and a GIANT gold watch. And though he was Seattle born and bred he talked like a Cajun from Louisiana. If you’ve seen Waterboy with Adam Sandler you know what I’m talking about. Twenty minutes later we walked out with our new plates. They’re only one number off—Matt’s car has a six mine has a seven. He can’t argue with that. The next day while I was at work I got a call from Matt. The stuff on the counter was regular dish soap I had bought the day before and put up there to refill the dispenser. I informed him there’s a slight difference between dish soap and dish detergent. I told him to put towels down and let if finish, then run it again with regular dish detergent. Twenty minutes later I get another call. What a cop out. That had to have been the lamest excuse for not cleaning up something ever. You’re better equipped…my foot. Good thing he’s cute or I’d throttle him. So anyways I get home, and when I open the door I notice something…odd. First, the basket of laundry is strewn across the dining area. Hmm. Then I distinctly hear Roy jump off the bed in the bedroom. And his head pokes out of the open bedroom door. Now, maybe you don’t know but we keep Roy in our bedroom while we’re gone. He hasn’t been too destructive, but in case he ever gets a wild hair at least the damage would be contained. So far he’s only eaten the door frame (but that was just his first week while getting used to being in there), a couple of books, numerous boxes of Kleenex, some magazines, a little bit of carpet, and one of my plastic hair clips that unfortunately came back up. Oh, and a heating pad. But other than that he’s been pretty good. So when I saw he had been loose in the house for a number of hours panic struck my heart. I thought of all the books we have in piles around the house, our car paperwork I had left out from the other day, my guitar, the spare room that was a mess of quilting stuff and I dreaded taking another step. Then I noticed in smack dab middle of the living room a jar of peanut butter. His peanut butter. He has his own jar…he gets the cheap stuff. So I see this jar, lid is gone, and the top is chewed off and the jar is empty down to the bottom inch of peanut butter.Roy was ecstatic to see me, as usual, but I was totally ignoring him as I slowly walked around the house to assess the damage. Luckily, the peanut butter, which he had gotten off the counter and managed to get the lid off, was the only thing he really chewed on. It looks like he may have had fun in the laundry basket, and my previously folded quilt was spread out on the floor in what had obviously become his nest. But other than that things were relatively undamaged! Good dog! Relieved our house wasn’t shredded, I turned to the dishwasher. I drained the pool of bubbles that was left, added some vinegar to cut through the suds and ran it again, but this time all the way through. It still bubbled, but not nearly as bad as before. 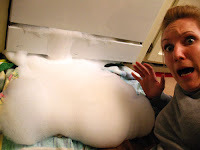 The blob did spread over a good portion of the kitchen, and Roy was pretty curious about it. When I took Roy out, I noticed the poop bag holder was missing from the handle of the leash. Hmmm. Matt told me his story. He had been running with Roy, and running pretty hard when the whole holder-thing broke off its zip tie and flew into some bushes. As Matt retraced his steps trying to find the holder, Roy took the time to take a large, lab-sized dump. Matt couldn’t find the holder anywhere and with no other choice he decided to move on. That was until a little old lady across the street who had been watching him began yelling at him. He tried to explain as she continued yelling and (I’m sure) shaking her fist at him. Finally, he asked if she had any extra bags since she was walking a little terrier. She gave him one, but it was about the size of a sandwich bag. Not so great for labbie poops. Matt somehow managed to get it all without getting anything else dirty. We got more bags the next day. And that is the end of that story. There’s not much more to tell, other than the other night when I brought in two weeks worth of groceries I had to take Roy with me to get the rest since I know he’d get mad and eat something if I came in and left right away. I was steering the crazy-wheel cart that the complex keeps in the garage with one hand, the trying to control my over-excited/potty anxious dog with the other. As I made my way out of the door into the garage, dragging the stubborn cart behind me as I was being drug by Roy I noticed a woman getting out of her car staring at me with her mouth open. Once everything was in I got hooked into a game of tug-of-war with Roy, and when I decided I wanted the game over I made my way to the shelf where his treat bag was. Reaching in, though, I was watching my dog slowly release his death grip on the fox tail/ball toy and I managed to knock the entire bag of treats out of the bag. Then began the frantic race to pick as many up while Roy frantically raced to eat as many as he could. Today, I watched a storm approaching. I wanted to take a picture of it but realized my camera was in my car so I'll have to describe it for you instead.In the southwest the clouds are a dark gray, but overhead the sky is blue and the sun is shining. I was out, propping up my snow peas and pinching the dead heads off my pansies when I noticed the wind stopped. With the sun shining down it was so warm I wanted to go put a tank top on. But as I sat down to watch the storm coming I realized I'd regret that decision soon. The sky above is undulated, like the bottom of waves when viewed from underwater. Slowly, Vashon Island disappeared into the approaching blue obscurity. Next Bainbridge Island was cloaked by rain as well. Within a matter of seconds, the temperature dropped so suddenly I had goose bumps even though the patio under my feet was still warm from the sun. The wind began to blow cold and moved the clouds over my head to completely hide the sun, and slowly I began to hear the patter of a soft spring rain. This rain feeds, whereas the winter rain felt like it wanted to ice you over. Now I'm inside wearing a sweater, but still have the windows wide open to let in that fresh rain scent. It’s raining harder now, so hard its making little bubbles on the edge of the balcony. Even West Seattle is clouded now, and I can hardly see the marina that’s only half a mile from our apartment. I noticed the wind was beginning to blow harder, and blowing rain in through the screen. As I got up to close the sliding door, that overpowering scent of the sea hit me. The good kind, not the nasty bad-ocean scent. No, this was a fresh, salty gale blowing into my house that made me wish I was out on the water right now. I’ll have to content myself with a pot of tea, though. And maybe an episode of The Deadliest Catch. I guess the only drawback is Matt it out on a run with Roy now…hee hee. Back to the storm. It’s still raining pretty good—I ran out to grab a fresh basil leaf and my back was drenched when I came back in! But we’ve got a cozy fire going, and can see the tail end of the storm—it’s beautiful! I almost washed the windows today…good thing I waited! 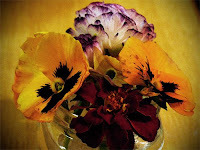 and these are flowers from my garden...I was having fun in photoshop. So that's all for today. I would LOVE to hear from any of you...seeing as these little updates take me a couple of hours at least! Let me know how you are, what's new in your life, what's old in your life, anything! If you made it this far--thanks!! !